Do you ever struggle with the “if it’s going to be, it’s up to me” mentality? Do you ever find yourself striving for the approval of others, even God, by trying to do enough, be good enough, accomplish enough? For many years, that could have been my autobiography. Until I became deathly ill and could suddenly do nothing but exist. During that time, God gently showed me that He didn’t love me because of what I did or didn’t do, but because I was His daughter. That was a life-changer for me! As a result, I’m thrilled to introduce you to my friend, Katie Reid, who is going to share with you her revelations with respect to this. I know you’ll be blessed! The story of Mary and Martha, in Luke 10:38-42, has caused women to feel guilty—for centuries. 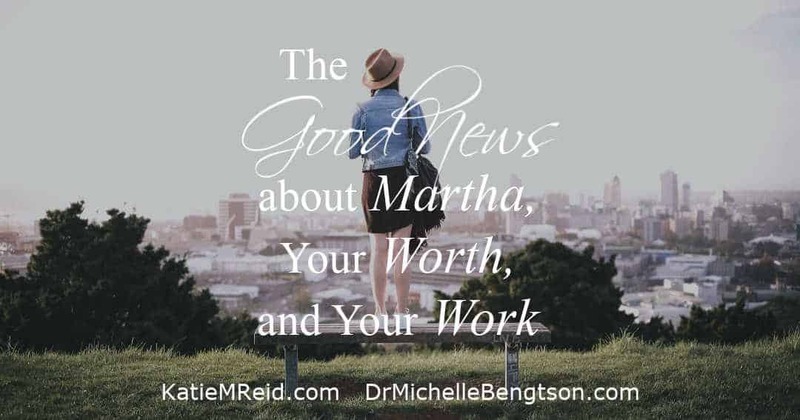 Since Jesus told Martha that she was worried and distracted and that her sister Mary had chosen what was better, we often feel guilty for being wired like Martha. We feel like Mary was the poster child for getting it right and that Martha was discounted because she was worried and distracted. For years, this passage in Luke 10 bothered me. If nobody works, nobody eats, right? I really wanted Jesus to tell Mary to get up and help her sister out. But upon closer examination, I realized how much Jesus loved Martha and wanted her to know that too. He wasn’t asking her to neglect her responsibilities but to trust Him to care for her. In John 11:5, we see that Jesus loved Martha and her siblings (Mary and Lazarus). His correction to Martha wasn’t a scolding but an invitation to work from a place of freedom instead of fret. Many of us have tried to shed the skin of our efficiency because we’ve misinterpreted this passage to mean there is something wrong with being made like Martha. But let’s not confuse correction with rejection. 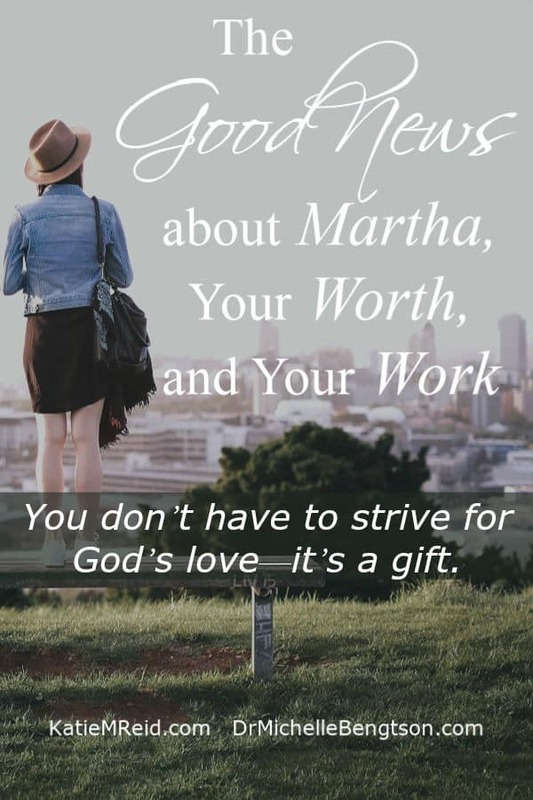 Jesus pointed out one thing that Martha needed to improve upon, but He wasn’t criticizing the totality of who she was. If we are in Christ, our position in His heart is secure. He loves us…even when we are short-fuzed, whether or not we have a quiet time, even in the midst of tackling our to-do lists. You don’t have to strive for His love—it’s a gift. 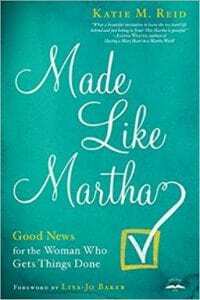 In Made Like Martha: Good News for the Woman Who Gets Things Done, we take a closer look at those of us who are doers. Being a doer is a good thing, but some of us “do” in an effort to obtain something that is already ours. Many of us are trying to earn God’s approval and favor, but we already have that if we are in Christ. Have you, like me, spent much time and energy trying to prove you are worthy of God’s love? When we realize we don’t have to strive for what is already ours, we walk taller and freer, knowing that our worth is not depended on our productivity but cemented in Christ. My brother is a few years younger than me; he has Down Syndrome. His worth is not based on how productive he is, nor is mine. We have worth because God says so, and it’s not based on how many items we check off our list. Now, our to-do list has value but it does not determine our value. We could never do enough to achieve our salvation. We are saved by grace and not works (see Ephesians 2:8-10). In Made Like Martha, the hired help mentality is defined. Those with this mentality think it’s all up to them to take care of themselves, like their worth is based on what they do and that they might lose what they have if they aren’t good enough. But a beloved daughter’s mentality is based on trust; knowing that love is not based on what you do, but based on who you belong to. A beloved daughter knows she is adored even when she messes up. Some of us have taken on things that were never ours to manage. In our ultra-responsible mindset we have placed extra weight upon ourselves, bogging us down with worry and exhaustion. As God teaches us how to live like a daughter instead of a slave (or the hired-help) we begin to cast off the heavy weight we’ve been carrying and place it upon His most capable shoulders. God has works prepared for us to do—but our position in Him is not dependent on our behavior or performance. Isn’t that such good news?! Katie M. Reid encourages others to find grace in the unraveling of life at katiemreid.com. She is a devoted wife, mom to five loud children, and a fan of cut-to-the-chase conversations over iced tea. 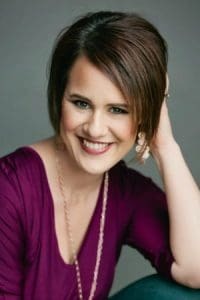 She is also a speaker and author of Made Like Martha: Good News for the Woman Who Gets Things Done (which includes a bonus 5-week bible study). Subscribe to Katie’s blog for weekly encouragement to help you breathe deeply and walk freely. I still struggle with this. Most of my life I took care of others while in the middle of my own darkest years growing up in abusive and neglectful environments. But now I’m the one who is so debilitated by all the years of working for approval, but rather proper acceptance of who I was. Now I have caregivers of my own five days a week. It’s been a rough adjustment for me until I read a devotion one time that said that it is a two way gift to let someone else help you because it is a double blessing, you get the help you need while at the same time giving the one helping a great sense of purpose. So when I had to sign up for in home care services, I prayed for God to bring the ones who needed His love. For Him to guide my words. I’m not perfect but they know my own testimony and both know my heart for God. I’m perking up because I have someone I can just be me with and I am getting much needed times of conversation. My husband is a sweetheart, but he suffers from severe social anxiety. He’s a man of few words. But I am learning that when he wants to take me out on a picnic, it’s been a two fold gift of a different means. He gets the nature break he is so needing, but I’m coming home much more relaxed. Used to it would irritate the daylights out of me , but then one day I was full of vim and vinegar ready to light up his ears,but it was right there in that moment God spoke to my heart and soul about my husband’s need for the impromptu excursions that always made my own plans go out the window. In that moment I recalled the verse, No greater love does a man have than this, to lay down one’s life for his friends. It got me to thinking about why I married my husband in the first place. He was and is my best friend. I was then reminded that charity begins in the home. As another author puts it, I am slowly growing wise. We are all on a journey to learn and become more like Him. We all have struggles of various sorts, and I think that is why God stresses the importance of fellowship and community. You may not be where you want to be, but thank God that He is transforming you so that you are no longer who you once were. I’m so blessed that you stopped by today. Because of Him, #HopePrevails! 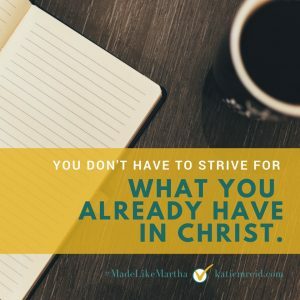 This is very encouraging for a fellow “Martha”! I’m right there with you Katrina! Thanks for stopping by. Hope we see you again. Blessings! So glad you were encouraged, Katrina! Loved this post and I’m currently reading this book! Thank you, Katie and Michelle for reminding us of a most important thing – our position in Christ doesn’t depend on our performance. Oh if I’d only realized this at a younger age. But I did figure it out at just the right time I suppose because God’s timing is just right! Thank you for sharing this! Hi Leslie! So glad you are encouraged. I felt the same way…wishing I had realized this earlier. But now we can help others who need to be freed as well. So glad you enjoyed it! I’m delighted you stopped by and hope to see you here again sometime. Blessings to you! I think you’re right about all of us longing to be a little more like “Mary” in this “Martha” world. Our peace comes from being still in His presence. But I’m grateful for messages like Katie’s that reminds us that as “Marthas” we still have great value. Blessings to you. Hope to see you here again! Thanks for reading, Tammy! Hope you had a great day at work. I too wondered for years why Jesus didn’t tell Mary to help Martha. Both are necessary. We need to be doers and hearers. Yes, been learning lately that not everything is my responsibility, even when I think it is. I have a friend who gently asks me, “Is that really your responsibility? Or are you taking it on as your responsibility when it is not?” Great questions to ask yourself. Because we women often take on more responsibility than really is ours. I couldn’t agree more. When we get so busy taking things on as our responsibility that really shouldn’t be, it sacrifices time and energy for the things He really wants us to do. What great questions your friend asks you. I’m going to remember that- so freeing! As one who does consider herself more of a Martha than a Mary, this is very encouraging to read! I actually added Katie’s book onto my Amazon wishlist. Thanks for the truth presented here and providing hope for us Martha’s out there! I can relate to you. I’m much more of a Martha but I am a Mary wannabe. But I’m so glad God loves both Mary and Martha. He just wanted what was best for Martha…much less stress. Glad you found a book that sounds like it might meet you where you are. Blessings! So glad you were encouraged, Denise! You can read Chapter 1 for free over at madelikemartha.com Enjoy!